It is without doubt that Gander’s greatest fame came from its beginning as being the largest airport in the world in the 1940’s and it’s role during the Second World War. WWII veterans; their children and grandchildren visit the town each year. Their greatest interest lies in this historical airport. Through our streets, being named for great aviators, to the viewing of artifacts and displays at the North Atlantic Aviation Museum or visiting The Commonwealth War Graves Cemetery, they seek to find the past told to them by their fathers and grandfathers. We can boast of many heros who were the pioneers of aviation but many stories have yet to be told of the military men and women who were stationed here during WWII. One of those stories, however, is known around the world. He is the massive war dog, Sergeant Gander, Regimental Mascot of the Royal Rifles of Canada who were stationed at Gander in 1941. Sergeant Gander’s story came to light when the Hong Kong Veteran’s Commemorations Association, insisted that his name be included on their Wall of Valour in Ottawa. 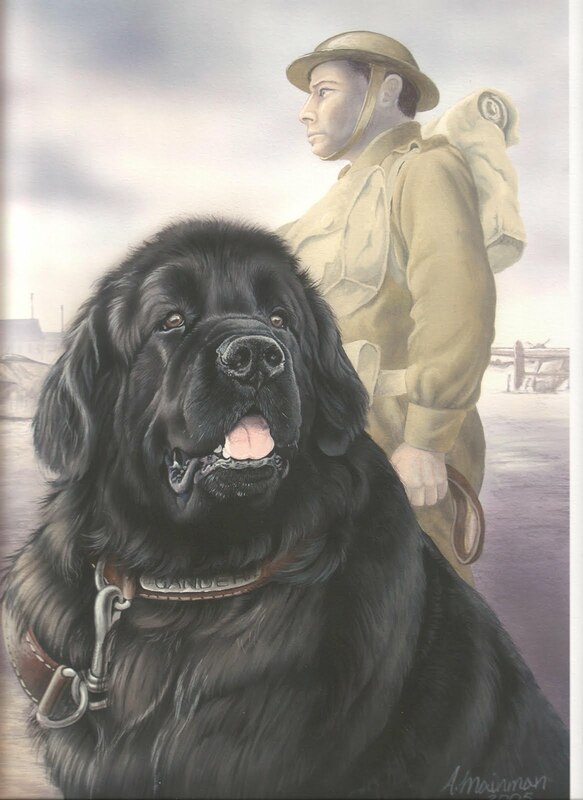 In 2000 “Gander” was posthumously awarded the English Dickin Medal for Gallantry (equal to the human Victoria Cross). This valiant and brave animal gave his life to save seven of his wounded comrades during the battle of Lye Mun on the island of Hong Kong in 1941. Sgt. Gander’s story is well publicized and can be accessed throughout the world. Books has been written about this courageous animal who was born at Gander and was a family pet before being adopted by a contingent of the Royal Rifles of Canada. 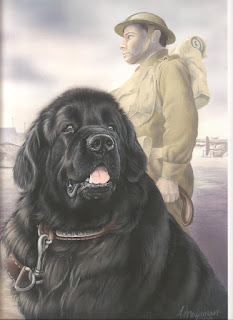 “I speak on behalf of all Hong Kong Veterans and especially us who were members of the Royal Rifles of Canada and were so fortunate to have adopted that magnificent dog, Pal, whom we re-named "Gander". He soon became everyone's pet, following us on manoeuvers, and being present at all important functions. His final act of bravery has endeared him forever in the hearts of all Hong Hong Veteran and his legend has become the subject of books and magazine stories. The posthumous award of the Dicken Medal is little reward for his sacrifice in battle when he harassed the enemy, and finally gave his life to save many of his human comrades. We are grateful for this further recognition of our famous dog, and pleased beyond compare that it should occur in the place of his birth. It is deserving that “Sergeant Gander” now returns to his hometown. Former students of Gander who regard themselves as the first children of Gander and having grown up in the 40’s and 50’s at the Airport adopt this project with pride as a gift to all future children of Gander.